Quiltville's Quips & Snips!! : iPhone-o-Gram!! Heavy Gifts! I was setting up for my workshop today in Kingston, NY when my phone rang. The caller, Gae, was saying that she was sorry she couldn't make the class, but did I find the gift her hubby had left at the office?? I hadn't been down there yet---and told her I would check it out. My first thought being---"Millenium fabric????" Second thought: bigger than a bread box! Third thought: heavy as a boat anchor! Holy cow! It IS a boat anchor!!! Thank you, Gae! I can't wait to get her home and try her out!! Wow!!! That's super. It's going to a good home! How thoughtful and sweet of her. Does machine have a name yet? OMG I wish some one would give me a present like that! It's splediferous as my Grand tees would say! That's an awesome surprise! Happy for you, you deserve nice surprises. How fun!!! I got a new (to me) one today too! Nice! I'll be looking forward to hearing more about this machine. It looks just like the one my son got at a thrift store for me. Mine is a 1951 Anniversary edition 66-16. Her birthday is Nov. 10, 1950, from Elizabeth, NJ. He didn't know or care if the machine would run or whether it had cord or foot pedal! I cleaned and oiled her, and she sews like a dream! There are no attachments, but it does have the original instruction book. Wow! What great shape it's in, too. What a generous lady! Can't wait to hear what you name her. How lucky you are that you drove SHAMU? If you decide to sell one of your FW let me know...I'd love to adopt one. 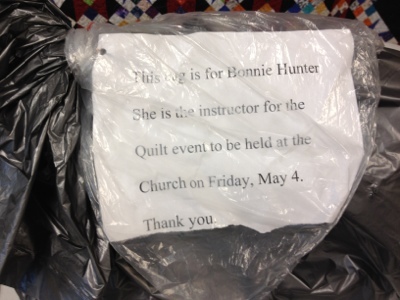 Congrats on the wonderful gift, Bonnie, what a thoughtful thing to do. How many does this make now? What an incredible surprise!! 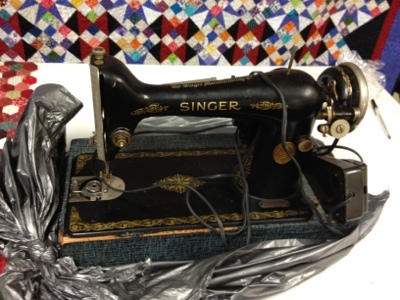 Tell us more about the vintage Singer sewing machine. What kind (number) is she. I'm so glad you finally have a sewing machine. I was feeling kinda bad for you! Lol. What a great surprise. Be still my heart!!! Lucky you. Oh My! Is that a 15? Sew pretty! i have one very similar to it! my father in law gave it to me! it sits in my dining room, along side the other machines, threaded ready to sew! she sews like a dream.. i havent thought of a name for mine yet... congratulations. In the category of parallel lives I was going to get home from work tonight and post pictures of two sewing machines I found at an antique store on a break during day 2 of driving 1000 miles to get home from vacation. One is a black wizard (as is) and the other is a singer in s Bentwood varying case that I think is the same model as your new machine, Bonnie. I will try to post pix later tonight! Btw ...love pizza and tj's too! Cynthia in Oregon, fresh back from trip to Las Vegas! I just can say " Oh my God!!!!" You deserve it, Gael couldn't find someone better then you to this precious!!! If this keeps up you may have to build on. She looks exactly like my loved machine - she sews like a dream but at some point has had a replacement motor - I know none of her history because I purchased her reconditioned from a shop as a second machine to use in a second home - now she's my favourite ! How thoughtful though I think you are going to have to have "the machine museum" built in the back yard just to house all your beauties. Congrats. You deserve it. Also...I love,love, love turkey tracks. Absolutely. I showed my husband your newly designed storage area....and all your fabric and machines. He just looked at me and said don't get any idea's or I'm taking the computer away from you. I'm sure this new machine will play nice with all the others. What a beauty! Tell us more about her when you have had a chance to sew on her. Wow! What a fabulous surprise. That's a sweet little beauty. Love your quilt! Reds and neutrals are one of my favorites! Thanks for the opportunity to win the 100 Blocks magazine. Can't wait for your new book to come out in July to add to my collection of your books. Great work!! 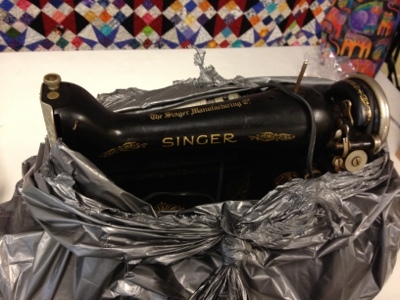 Now who else but Bonnie Hunter would be gifted a vintage sewing machine by a total stranger??? Hope you can make room for it in Shamu. I have a sewing machine very similar to that 'boat anchor'. Quite heavy, certainly not a featherweight, but it can sew through jeans seams! We sewed sleeping bags from kits around 1980 with it. I just looked up the info on mine this year, and it was made in 1948. Using a Janome for quilting now, but this machine has a nice history. Oh MY! What a nice present! I'm still looking for me one.